Why is it that the simplest looking photos are often the hardest to make? 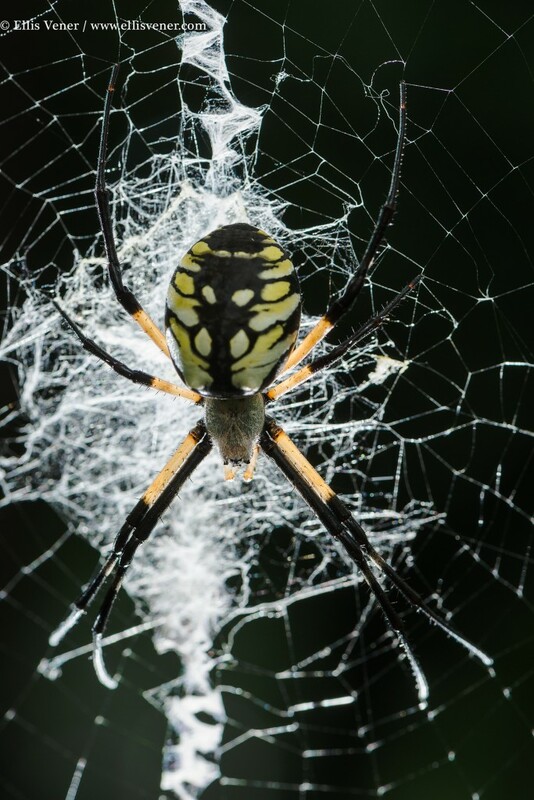 Consider this picture of a common Argiope aurantia or Yellow and Black Garden Spider, also sometimes called Writing Spiders. The idea came easily enough: “Look at that colorful yet scary looking big bug!’ Okay, so a spider isn’t technically an insect, it’s an arachnid. But you get the idea. The hard part was getting the camera in the right spot down between the two Boxwood shrubs she had located her web between. To do that required using the Really Right Stuff components from my PG-02 Pro Omni-pivot package plus a few others. That’s what I like about Arca-Swiss based quick release components but especially Really Right Stuff gear: they remind me of the Erector Set kit I had as a boy. I needed a jib to drop the camera down between the two shrubs. For the jib’s main arm I used a CB-10 and CB-18, joined together with a CB-HC1. For the “fore-arm” of the Jib, I used a PG-02 VA. The real trick was attaching the PG-02 VA to the camera bars so that could very precisely control the left to right orientation of the camera (the gimbal in the PG-02 VA was used set the pitch angle) and how close the camera was to the subject. Making the connection between the PG-02 VA and camera bar required an RRS FAS Sliding Clamp holding the Camera bar and a PCL-1 Panning clamp [recently replaced by the PC-PRO clamp]. A short MPR rail served as connector between the PG-02 VA and the PCL-1. By sliding the FAS along the camera bar I could set the camera-to-subject distance and I used the PCl-1 to set the horizontal rotation angle. Supporting the jib was a large, heavy tripod and head combination, both designed to support really big view cameras. The tripod is the now long discontinued aluminum Gitzo 410C and the head is a panning double tilt Foba ASMIA. On top of the ASMIA’s camera platform I keep a second PCL-1. Since the camera was going to be in a spot I could not access without disturbing the subject, I used the CamRanger system with an iPad. The Cam Ranger acts as a wireless live view screen with nearly full control over the camera’s settings, along with several other capabilities like HDR exposure bracketing, intervalometer, long exposure timer, focus peaking, and Focus stacking. As with my RRS gear I feel like the Camranger is a gadget that pays for itself every time I use it. To light the spider, which we’d taken to calling Charlotte after the title character in E.B. White’s book, I used two LumoPro LP180 Quad-sync flashes. To trigger the lights a trio of PocketWizard MultiMAX v2 transceivers was used, one as a transmitter on the camera and one connected to each flash. For fill I rested a stiff white sheet of paper on top of the lens and taped to the PG-02 VA so it wouldn’t get blown in the web. To get a basic light level setting I read the flash output with a Sekonic L-758DR meter. In the end I shot 27 frames over the course of about an hour. Using the feedback I was seeing on the CamRanger/ iPad combination (while the full resolution raw files stay on the in-camera media, as you shoot the CamRanger downloads JPEG “preview” images to your mobile device or desktop computer) was sending to the iPad, between each frame I’d tweak the prime focus point and exposure settings, and also change the quality of the light by moving the lights and the amount each light was putting out. The goal of deploying all this technology wasn’t to make a technically perfect image, but to make a photograph that I believe expresses Charlotte’s uncannily spooky beauty and evoke the primal fear and fascination we feel when looking at them. Ellis Vener is a photographer and writer based in Atlanta, Georgia. Article and images Copyright ©2013 Ellis Vener. All rights reserved. Ellis, your patience and determination really paid off. No doubt your deep experience and methodical approach were the key to producing an amazing image. Thanks so much for sharing your technique with us. Joe Sr.
thank you for the opportunity, Mr. Johnson. Spectacular shot, Ellis. The trouble you took to get it was well worth it. Sad to say that after we had a cold front and rainstorm come through early last week, Charlotte disappeared. I know she mated and laid eggs so hopefully next summer we’ll have the next brood setting up in our garden. It was really fascinating to watch her through the summer and early fall. From wrapping up and eating prey, to dealing with suitors, remaking her web , and dealing with rain we got a lot out of spending time and observing her. Pretty cool, Ellis. Thanks for sharing the images and techniques! Thanks everyone. I hope the info helps you make the photos you want to make. I just bought Camranger and try to figure out how to do focus stacking. How do you determine the start and end points on Camranger? Because no button on those. How do you determine the number of shots to be adequate to cover from start point to end point? It’s pretty simple. With the CamRanger app on your tablet or phone in live view mode, and the AF on your camera and lens turned on, double tap the screen on the point in the image that is closest to the lens, so you can really zoom in on that point and select exactly the point you want to start the sequence on. Decide what size steps (small, medium or large) you want and how many shots you want to start with. Tell the CamRanger to start the sequence and it will take it from there. Once the sequence is finished examine the final shot to see if if the last frame is focused far enough back to get the depth of field you desired. If the answer is yes you are done, but if you need more steps n the sequence, without changing anything, start the sequence again and the CamRanger will continue from where it left off. What program are you using to to create the composite image? The lens i use is Canon 100mm f/2.8L macro, the aperture is f/8, the distance from the lens to the subject is around 20cm and the focus stacking application is Helicon Focus. The subject is a single flower. Do you have a rule of thumb for the number of shots needed? Is it the max allowed that is 50 for small step or say 25 for medium step or 10 for large step? Thanks so much for sharing your experience on CamRanger, Ellis.